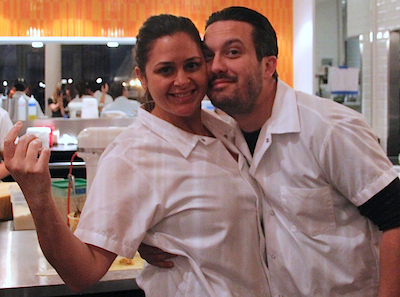 Chefs Antonia Lofaso and Fabio Viviani mug for the camera before a busy dinner service at Top Chef Kitchen in New York. This week at Top Chef Kitchen by Bravo in New York City, Top Chef alums Antonia Lofaso and Fabio Viviani are the featured chefs at the one-of-a-kind, four-course dining experience from Bravo’s Emmy®- and James Beard Award-winning television series, Top Chef. Viviani has two restaurants in Los Angeles, is opening a new restaurant in Chicago, and is scouting a location for another in Miami. When he’s not in one of his restaurants, he is filming his show Chow Ciao! on Yahoo! Lofaso owns Black Market in Studio City, California, and is opening a second as-yet-unnamed restaurant in March 2013 (although Viviani claims they do know the name and it is one he suggested). We caught up with them pre-service in Top Chef Kitchen, as Chef Lofaso was making ravioli for the evening’s dinner. Were you intimidated to cook for New York foodies? FV: I’ve done a lot of private parties in New York, but I never cooked for a restaurant. I got kicked off Top Chef twice in New York, both seasons, so New York doesn’t faze me anymore. Fabio, what was it like working with Antonia? FV: We were on a season of Top Chef together, so I know she can be very difficult at times. AL: That’s when I turn my head [away from him]. FV: I love her to pieces. Were you excited to work with someone you were a little familiar with? AL: With Fabio? For this? Yes! So many times when we do these events, it can feel like we’re being more competitive *after* the actual competition versus during. After [Top Chef], it’s more like, ‘Oh my god! What is everyone doing? Is my food better?’ Fabio is just so easy. Not easy in a sleeps-with-a-lot-of-women sort of a way. AL: I called you easy. [Pause] Actually, he may be easy in both senses of the word. FV: I’m easy — easy to please. AL: Yes, that’s for sure. He’s just sweet, and he’s all about good food, There’s no ‘I’m so much better than you’ air. FV: It’s not about bragging rights. It’s about having fun! And making good food today! Even though my food is better. You have created separate Top Chef Kitchen menus, but diners can mix and match. Was there a discussion ahead of time about how they would meld? How Do You Open a Restaurant in Manhattan? Practice, Practice, Practice. Opening a restaurant anywhere takes a lot of, well, everything, really. Talent. Vision. Faith. Blood, sweat, and tears. And, oh yes, money. Opening a restaurant in the dining mecca that is Manhattan takes a lot more of all these things. Thankfully, for us diners, there are lots of folks who want to do it, despite the obvious hurdles. Driven by a passion for creating amazing food and experiences, Felipe Donnelly and Tamy Rofe are among New York City’s aspiring restaurateurs. Advertising pros by day, they are taking a decidedly different, new-school approach to making their dream a reality, via Worth Kitchen, where they host intimate dinners for the growing number of fans they’ve carefully cultivated through social media channels, including Twitter and Facebook. Not yet an actual restaurant, Worth Kitchen’s smaller dinner parties are free of charge but by invitation only. However, this husband-and-wife team have already pulled off their first open-to-the-public pop-up dinner, and another is on the calendar for March 17th. I dined with them last night, and I look forward to the day that Worth Kitchen is on OpenTable. Check out our slideshow and interview with the founders, after the jump. If you don’t know what LudoBites is, well, you should. It’s a dining sensation that’s single-handedly sweeping the City of Angels. A pop-up restaurant executed in sheer guerilla style by renowned chef Ludo Lefebvre and his wife/partner in culinary crime Krissy (aka FrenchChefWife), LudoBites has become the hottest, tastiest ticket in Los Angeles. As you may imagine, the Lefebvres experience enormous demand for the unique dining experiences that are the roving LudoBites events. OpenTable stepped up to help them answer that demand in a democratic and efficient manner (first come, first reserved, if you will). However, while using our system for their latest event, LudoBites 6.0, all did not go according to plan. We apologize to the Lefebvres and all of the diners who experienced technical problems while trying to book reservations for LudoBites 6.0 last night. LudoBites is a phenomenon that concentrates unprecedented reservation demand for a single restaurant with a limited number of tables in a very short window of time. We had a plan for how to customize our service to accommodate the extraordinary search volume for LudoBites 6.0, but we didn’t implement that plan properly. The traffic overwhelmed our systems, and some hopeful diners experienced intermittent problems until the restaurant was fully booked after less than 90 minutes. OpenTable was built with the idea that securing a dining reservation should be effortless. We didn’t live up to that promise under the unique conditions of LudoBites, and we’ll be taking a closer look at our processes to ensure we deliver a consistently high-quality experience in the future. To learn more about the talented Chef Lefebvre and the one-of-a-kind LudoBites, please visit LudoLefebvre.com.